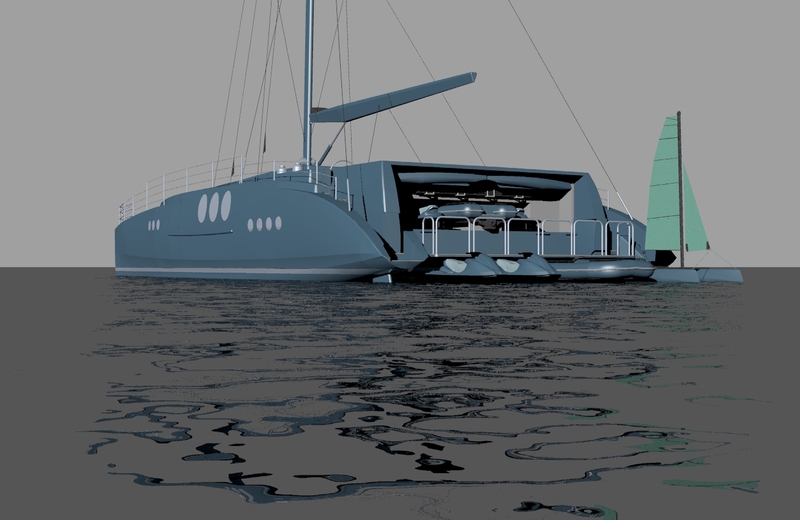 Craig Cunningham has designed a new high performance cruising catamaran, ENDLESS SUMMER. 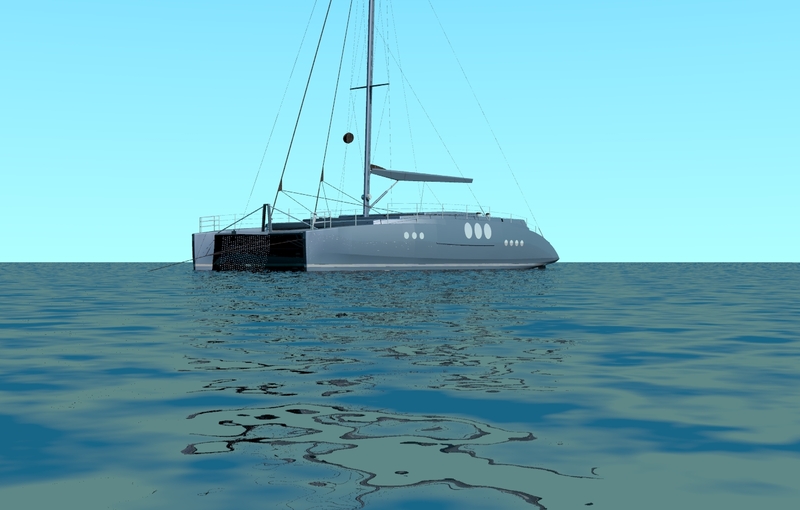 This bold gunmetal multihull has an edgy presence, which projects right off the drawing board. According to Cunningham, “the high performance hull form is married to styling that is inspired by the 1960’s Jaguar MKII with sweeping sensual lines.” The torpedo shape of the hull in profile also projects a masculine, militaristic command of strength and high performance. As a high performance yacht many construction details remain under wraps, yet it is evident from the GA and renderings that ENDLESS SUMMER features impressive deck spaces and innovative interiors with ship design features that configure to a near Jetson’s futurism. The voluminous salon stretches out full beam. 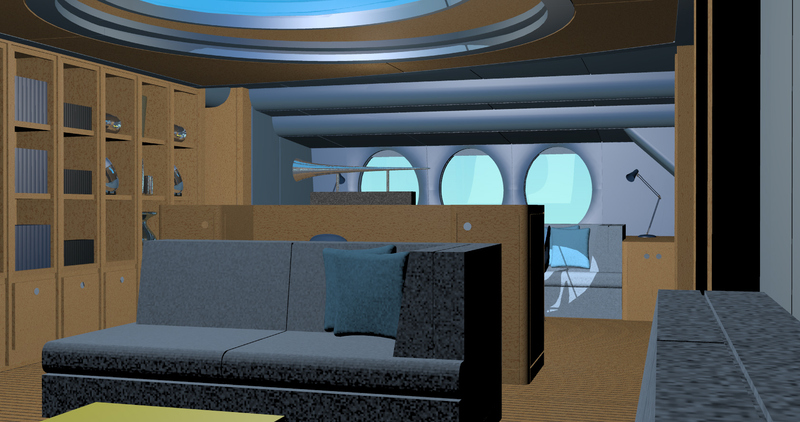 Cabins with a maximum of twelve berths can be configured to suit a varying combination of guests and crew depending on private or charter use. The ample aft garage has space enough to store the tender, waverunners, diving gear and other toys. When open this section folds out to create a sweeping beach deck. The raised cockpit provides excellent views and is similar to the high performance catamarans that tend to have an open bridge deck arrangement. ENDLESS SUMMER is a cutting edge concept that would seem to have tremendous potential both as a private and as a charter yacht. We will continue to monitor the exciting progress of ENDLESS SUMMER. Please follow these helpful links for information on Luxury Crewed Catamaran Charter and Bareboat Catamarans.